I can tell you what I was doing exactly a year ago: to the day, to the hour, to the minute. I was lying in intensive care, dazed and more than a little confused, after having metal rods screwed into either side of my spine and 2/3rds of my vertebrae fused in place. I have scoliosis to thank for that. Three hundred and sixty five days later, here I am - with memories that will never fade or pale like the scar on my back. I feel good... Better than that, I feel grateful. To commemorate the occasion, I thought it apt to accessorize my scar with a vintage skirt, vintage gloves, a silk scarf top and plenty of strings of faux pearls. I also realised it would be the perfect time to put up one of the three pieces I submitted for the Vogue Talent Contest that I won; an 800 word 'memory' of intensive care. 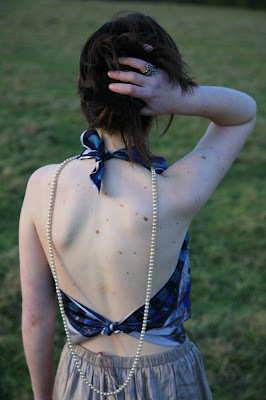 The other photos throughout are ones I took of friends for my GCSE art project last year, in which I focused on the contrast between straight and twisted - culminating in two Frida Kahlo-inspired plaster casts of backs with raised spines - one perfectly vertical and one in the full, curving throes of scoliosis. As you can probably tell, I am now fascinated with images of backs. The second set of black and white photos are of my fabulous friend Flo (aka the photographer), who will be shortly posting her own work on her tumblr here. This is the article - it was the first piece I wrote of the three. 'I wake in Intensive Care. The bleeps are a cooing flock of birds – reassuring me that they are watching from the shadows. My body is bound down. I am Gulliver; attached to wires and tubes, like an autumn tree with new vines. It is three in the morning. I know because I ask the nurse who is filling in a chart at the end of my bed. I’m wide awake and I want to talk. I tell her my plans for A’levels and later, University. She listens and speaks in a soft, warm voice. I don’t feel pain, just faint nausea. We discuss women’s rights – I think I’m surprised to be having this conversation less than nine hours after surgery. I think I may be talking quite fast. She checks my temperature and melts away. Funny how one day a word can enter ones vocabulary and cause so much change. It’s like flicking to an unknown page in a dictionary, running a finger down the words and choosing an entry at random. Congratulations, that word - scoliosis - is now yours to keep, nurture and deal with! The swerve of the ‘S’ matched my spine, the vertebrae of its soft letter shapes standing out on the page. Scoliosis: a curvature of the spine comes from the Greek ‘skolios’, meaning twisted. It is often, but not exclusively, diagnosed in teenagers like me, sometimes after a growth spurt. Mostly it is idiopathic, meaning simply that there is no known cause. No explanation. No reason. It just is. This word began intruding into my life right at the beginning of 2010. And in autumn of the same year, I am here, lying in a darkened room filled with humming machinery. My helter skelter spine has been turned into a drop slide, with scaffolding ; fused into place using titanium rods and screws. I may not have fallen down a rabbit hole, but the sudden height gain is disorientating - two and a half inches in four hours. During my pre-op pep-talk, the orthopaedic nurse told me the first night would pass in a groggy fog of sleep. Instead I am reclining on a fluffy cloud of morphine that blurs the edges of the pinched lights and dulls the pain to a faint and far-away ache on the earth below. My back feels heavy and stiff, like a blackboard with a new bold line running down the centre, chalked in flesh. Lying in bed, my legs being nudged up and down by a pump, images from the last twenty four hours whir and flash like Polaroids. Click! I wheel my heavy suitcase, loaded up with books and silky pyjamas, along a hospital corridor. Click! In a silent waiting room, I leaf through a Vogue. I read about the Ballet Russes, admire Tim Walker’s photography and wish I could be somewhere with my camera instead of here. I see a young boy with a back twisted like a tree, like mine, and wonder what private struggles his family are experiencing. Click! A sympathetic radiographer asks me to lean to one side and I emulate the pose of the model in the magazine I was reading. The machine flashes sullenly. I wonder how those invisible x-ray particles can be speeding towards me. I imagine the contraption shooting out stardust, defining the silvery trail of my spine. Click! I sit in a bland hospital room, full of white furniture and the smell of desperate hope. Minutes drag past like slugs. Click! A well cut tweed jacket and smiling eyes – my anaesthetist introduces himself, shakes my hand, tells me the next time I see him he’ll be wearing scrubs. Click! I’m wearing a hospital robe and scratchy paper pants. I lie down on the bed, my chariot, which will bear me to surgery. Click! The anaesthetist, in pale green, still smiling; picks up a syringe. “This will just feel like a pinch.” I squeeze mum’s hand and stare at the clock above my head. It shivers, wobbles and disintegrates as black shutters crash down, and the film runs out. In the morning, Irish and Afro-Caribbean accents mingle into a murmur. They are interspersed with a rhythm of beeps. My feathered wings of morphine are slowly drooping in the light of day, until they are replaced with a clipped leaden pair that weigh my back down and fill it with wrenching ache . These wings will not fly; like a fallen angel they have no use but to remind me of the pain to come. 'Backbone' implies strength and solidarity - it's a word we use to describe those who are unwilling to budge in the face of adversity. That's why I was so overwhelmed when my friend Esme designed and made me the brooch that appears in my header, and I was thrilled with the attention it received at London Fashion Week, being featured on Altamira, Vanessa Jackson, Fashionistable and Stockholm Street Style among others. How heartbreakingly sad, yet written in a stellar fashion very few are capable of. You should be proud of this piece and your conquering of scoliosis, as I am sure you are! This is so inspiring. Having been operated on myself this year, I can understand that feeling of late night morphia highs, and that hospital feeling. You write about it all so beautifully, and the pictures are so elegant. I especially like the first few of you in that gorgeous dress. It's obviously had a huge impact on your life, yet you seem so strong because of (or despite) it, and that is what makes this post so moving and inspirational. Thank you. Wow, such a journey. Lovely post, the pin is amazing. Oh wow! What a story! I'm very sorry to hear that you had to go through all that! I have (had?!) scoliosis but nowhere near as bad as you. I had to go to a special gymnastics class for a few years while I was still growing. Personally, I like scars. And you are wearing yours wonderfully. Wow I cannot imagine anyone who has to go threw that. Thank god you're better now! Is it possible for scoliosis to come back? I sincerely hope not. Ah, this topic is so close to my heart. You are so brave and beautiful in the face of this. I admire your turning your experience into something beautiful and inspiring for the rest of us. My mother had exactly the same operation (though, I would think, more primitive) back in the '40s, when she was 9 yrs old. Your spinal scar in the first image reminds me so much of hers, as does your elegance in the evening gown. I can only imagine how life changing this is for you and your family. Several years ago, my mother made a comment that she never wanted to be hospitalized again the way she was back then. (She recuperated in the hospital for an entire year.) It is so wonderful that you are out and about, a full 2 1/2 inches taller, and possibly more lovely and eloquent than ever before. Wow I can't believe its been a year already! I remember seeing your brooch. It is a stunning piece. Thanks for sharing your submission. You go, girl! It must have been hard for you and see the memories on your back is maybe painful. But you habe become a really successful person and your blog is a real treasure. Thank you once again for this wonderful piece- a complete joy to read! I lived your story with you, and feel so good to know that you are out of the dark tunel feeling grateful, happy and wiser. Much love and admiration, dear Rosalind. I myself I have never gone through any thing like that so I could not fathom everything that you must have felt. The way you describe your haunting and what must have been a hard experience is incredibly inspiring and captivating. Thank you for yet another beautiful post. well done. I can really relate to the operating table, having have surgery done to my face and neck. Beautiful images as well. am glad that you are okay now.. i can relate to you because i have a friend who also has scoliosis but hers was really not that arched and the doctor has told her that it would not do any further damage to her spine because her bones are matured..
it is really a very unforgettable story especially you've experienced it at a very young age and it really matters to us girls because of the way we dress,, i really know how you felt that time.. but at least you are already okay now..
love your blog, following you now..hope you could visit my blog too..kissess!!! Wow, such a great post, it is an expression we use so much but we rarely realize its true meaning, fantastic! what a journey you've been on. and what amazing writing. you're a true inspiration, roz. i remember seeing your spine brooch. it's wonderful how you took a challenging and painful situation and used it as fodder for your GCSE art project! i would love to have seen the plaster casts you created. You write everything so beautifully, my dear Roz! Your words seem to bring alive those moments in front of our eyes......wish you never have to relive those moments again.....! I think that brooch is fabolous, and one of the best presents a friend could do to me. You're a terrific writer, Rosalind. This piece is so moving. I used to work with severely handicapped children, a good number of whom had scoliosis. Some wore corsets, others had to go through operations. Most of them couldn't speak, so they couldn't verbalise their bewilderment, their fears, their pain. When I think of 'my kids' going through the same process you had to go through, it breaks my heart a little. But at the same time your writing manages to soothe me. I truly admire your courage, and in it, I hope to find the courage of others close to my heart. Thank you. That was really interesting and heart-warming to read! I'm glad everything went well, although I'm sure it has not been an easy ride. Wow, you're such a beautiful talented strong young lady! Those are absolutely stunning photos- I love how you beautifully you chose to commemorate your surgery and turn it into something beautiful in its own way. Beautiful post. Your article is amazing and so worthy of your award, and these photos are great. Fantastic job. It has been a year now, that is amazing. This post is as wonderful as its writer. You have turned such a negative into a beautiful positive. Roz, you write so beautifully. I forgot to tell you that I ran out and bout vogue UK to read your contest winning article while I was over there. When I was finishing school my writing was over-thought, pretentious and wordy. I constantly aspire to write as clearly as you do. I have also FINALLY got around to writing a little about the archives, and plan to do a few more posts - let me know if there is anything specific you'd like to know :) And thanks for encouraging me to write about it! Sometimes it is too easy to let my blog turn into a series of pretty pictures and not much else! I'm very glad now you're fine! I can just immagine how hard and painful it was! Take care! Oh, nice pics by the way! I don't know where to begin praising this piece or which image to call my favorite. Maybe it was the first image that ties you to the whole long tradition of English letters like the great writer I think you will be-- that Gulliver analogy was perfect. That was one of the only books a French library in Allencon had in English, and I read it three times when I was eleven and staying with my grandmother. Gulliver awakens bewildered and confused...on a journey, not sure where it will take him but brave and resourceful... it called up those sunny, lazy days in the French countryside for me. I think it was a perfect analogy. Then the description of your morphine wings was equally gorgeous. The whole piece was cohesive, rich, passionate, intelligent...I'm just blown away by you. We'll see. The important thing is to write! Anyway the incredible imagery of your writing and the sweetness and intelligence of your tone aside, this was a very moving piece, bringing real tears to my eyes. I'm so happy for you that you've overcome and gained such strength and insight from your ordeal. You're really an incredible writer.